1. The Craft & Co debuts its first Gin Night Market where you can taste more than a dozen Australian and New Zealander gins. 2. A pop-up gin alley is appearing at Wilson & Market’s The Terrace with tasting flights showcasing five gins (including locals Patient Wolf & Death) alongside gin-inspired canapes. 3. Alchemy Distillers are pitting Victoria’s gin distillers against one another in a Battle of the Regions. Taste and vote for your favourite out of Mornington Peninsula’s Balcombe, Mildura’s Fossey’s, Melbourne’s Patient Wolf and Alchemy themselves representing Healesville. 4. Taxi Kitchen and Anther Spirits are offering five course and five matching gin cocktails at their Botanical High Tea. 5. Henry Sugar have developed gin and tea-based cocktails to go with their twist-on-traditional High Tea Lunch. 6. The Bitters Lab and Poor Toms are teaming up for a gin cocktail class. 7. Amid their rejuvenated Beefeater 24 Gin Garden, The Cricketers is offering four different flights with tonics and garnishes to DIY. They’ll also have over 20 other gins to choose from for your full-sized tipple. 8. Locanda is hosting Tassie’s Lawrenny Estate for a five-course ‘paddock to bottle’ gin dinner. 9. Bass & Flinders will be serving up their new Winter Gin cocktails and mulled wine spike with gin (as well as live tunes and pizza) all weekend long as part of the Mornington Peninsula Winter Wine Weekend. 10. Madame Brussels has invited Patient Wolf and the rest of us to a dessert and gin-soaked High Tea Garden Party. 11. Biff Tannin’s is is hosting a free meet and greet with Cedar Fox Distilling Co and trivia with the Gin Gals podcasters. 12. The Forager’s Drop are doing a special World Gin Day cocktail menu, showcasing all of Four Pillars’ range, and introducing the new Tiny Bear Distillery via half-price G&Ts. 13. Kilderkin are guiding you through the day with free distillery tours to work up a thirst. 14. Fossey’s are throwing a bluesy laneway party and have released a limited edition World Gin Day spirit. 15. Reed & Co have invited three other distillers to contribute a signature botanical to create a limited edition, collaborative ‘Gin4’ gin. They’ll have meet the maker sessions and a five-course gin cocktail dinner too. 16. Monkey 47 takes over Union Electric’s rooftop gin garden for a Gin Jungle party of special cocktails, tastings and treats that will last the whole month long. 17. And to Gin Palace; their nautical ‘Navy Strength’ themed day is a big’un. In the depths of their Swamp room, Hendricks will be holding court at a ‘Very Unusual Lunch’ of four surreal courses with matching cocktails. Or order something with Monkey 47 and slip into a “deep sea abyss” (you’ll find out what they mean when you get there). They’ll also have Plymouth martinis paired with massage and Tanq 10 accompanied by fresh oysters. And, pre-book a cocktail to converse with the distillers from Patient Wolf or chat with the makers of Brookies. 18. Animus’s open days over the weekend are your chance to try an unreleased gin and a new barrel aged-gin. 19. Chuckle Park has created a trio of cocktails just for the day with Drumshanbo Irish Gunpowder Gin. BTW: The Silverlake Social are doing $12 Negronis on tap for World Gin Day (and Negroni Week) / Martinis, G&Ts and Negronis will be two-for-one all day at Gin Palace / Alchemy are offering free shipping on gin / Knocklofty is also offering free shipping on gin / Barwon Heads Wine Store will have free local and international gin tastings in the afternoon / Plus 5 are running rotating weekly gin specials all month long / The Gin Queen is hosting a fabulous Distillers Gin Dinner but it’s very sold out. Go stalk her socials in case there are any last minute cancellations. Did we miss anything? Send us a message with anything you find particularly ginteresting. Thinking of hibernating his weekend? 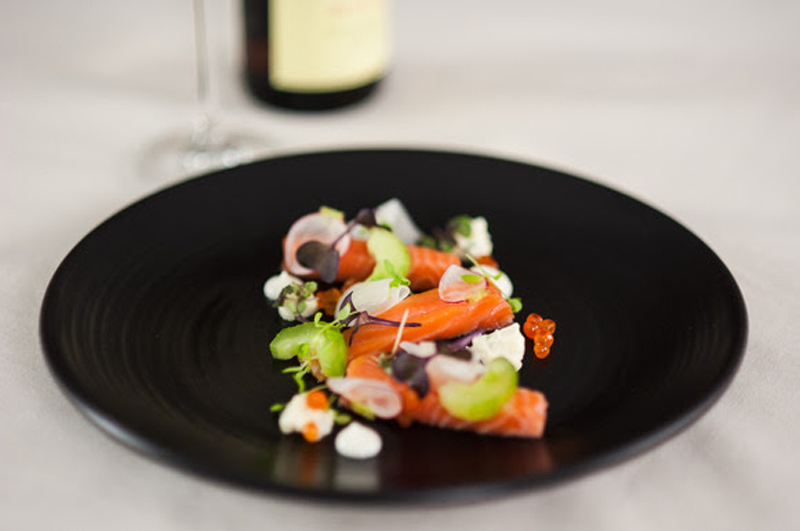 You can still be g-inspired to celebrate at home with this Gin Cured Ocean Trout recipe by exec chef Quinn Spencer of Tommy Collins by Atlantic Group. Curing time: 15 hours. Pat the trout with damp paper towels. Remove any protruding pin bones with tweezers. Use a ceramic dish wide enough for the fillet to lie flat in. Combine the sugar, salt and sprinkle half on the bottom of the dish with ½ the gin. Place the fillet, flesh side down, into the dish. Cover the fillet with the remaining gin on top of the fish then remaining salt. Cover the fish completely in plastic wrap, very tightly. Weigh it down (without crushing it) with a heavy dish. Place the ceramic dish in the fridge and leave it for 15 hours, turning the fish once. Heat oven to 150C. Remove the skin from the fillet leaving the skin and fillet intact. Put the skin between two pieces of baking paper and then between two baking trays. Place in oven for 8 min then turn the oven off and leave the skin in the oven for a further hour to dry out. Remove trout skin from the oven and allow to cool. The skin should be firm enough to snap. Break off small pieces of skin and fry in a wok at 190-200C; the skin will puff up like a prawn cracker, drain well and set aside. Assemble fish and skin on a plate and garnish with micro herbs, edible flowers and/or crème fraiche. Thanks for the comprehensive summary. I’ll drink to it!